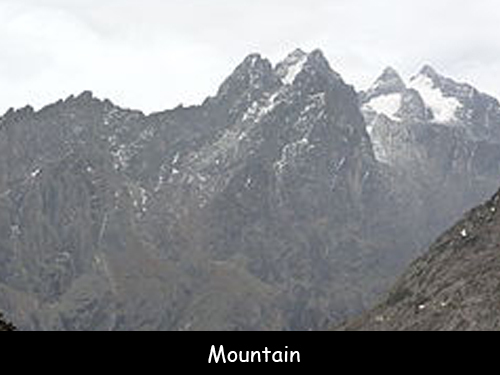 Mountains and Volcanoes are somewhat similar but the major factor that makes them different is their formation. A mountain is formed due to various geological processes like movement and opposition of tectonic plates but a volcano is formed around a vent that allows magma to reach the surface of the earth. It all has to do with plate tectonics. A mountain is formed by the movement and opposition of tectonic plates. When two of them collide, they form pointed peaks and valleys by crumpling the edges. A volcano is formed when lava gets collected after several volcanic eruptions and a vent allows the magma to reach the surface. It forms volcanic stones by cooling down around the vent. A volcano is a type of mountain but it has magma, crater and lava. A mountain does not have these three things. Mountains are peaceful areas whereas volcanoes are very much dangerous and not a good place to stay. A mountain will have an elevation higher than its surroundings but not all volcanoes rise higher than their surroundings. Volcanoes can be a part of mountain ranges. Kilimanjaro qualifies as both, mountain and volcano. Mauna Loa in Hawaii is the tallest volcano in the world – Mauna Loa is over 33,000 ft tall from its base under the sea to its peak above sea level. The word volcano in named after the Roman God of Fire “Vulcan”. 90% of our planets volcanoes are in the Pacific Ocean in an area called “The Ring of Fire”. Magma is the liquid rock within the volcano, once the magma comes out of the volcano is then called Lava, if lava cools quickly it becomes basalt a form of igneous rock. 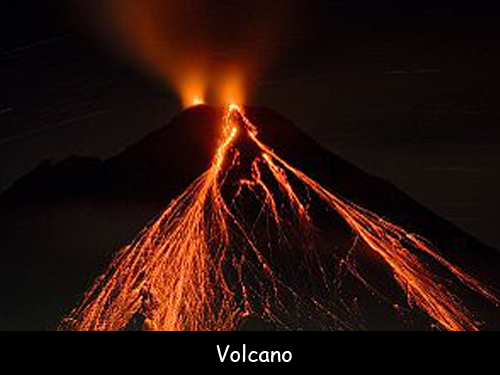 Currently we have over 1900 volcanoes that are active. These volcanoes have the potential to erupt. The largest volcanic eruption experienced by mankind was back in 1815 when Mount Tambora on Sumbowa Island erupted (Mount Tambora located Indonesia). The soil around volcanoes is rich and fertile, that is why so many people live around volcanic areas. There are 169 volcanoes active in the United States. Yellowstone National Park is deemed to have United States most dangerous volcano. Mount Etna in Italy (Sicily) is Europe’s largest active volcano 10,922 feet tall. Lava in an eruption can reach a whopping temperature of 1200 Degrees Celsius. Although Lava is extremely dangerous after a volcanic eruption, the volcano has has another and more dangerous flow called a “Pyroclastic Flow”. A Pyroclastic flow is made up of hot gases and fragments that flow down the slopes of the volcano destroying everything in it’s path. It can travel at speeds up to 430 mph.